Charles R. Darden, NAACP president, Mississippi, 1960 (Mississippi Department of Archives and History, Archives and Records Services Division [#1-4-0-40-1-1-1])Original photograph scanned as TIFF in 1994-95 by MDAH pursuant to ACLU v. Fordice, 969 F.Supp. 403 (S.D. Miss. 1994); original rescanned as TIFF in accordance with MDAH digital archival specifications for photographs, 2002. Credit: Courtesy of the Mississippi Department of Archives and History. Charles R. Darden served as the president of Mississippi’s state conference of branches of the National Association for the Advancement of Colored People (NAACP) from 1955 to 1960. Darden was born in Lauderdale County in 1911, attended Meridian public schools, and became a photographer as well as a prominent voice in the local civil rights movement. Darden was instrumental in establishing a chapter of the NAACP Youth Council in Meridian and served as president of the organization’s Meridian branch. Darden’s civil rights activities earned him surveillance by the Mississippi State Sovereignty Commission, which tracked his movements across the state and kept records of the attention he garnered in national and local press. Darden was employed part time by a company that sold class rings in black schools throughout the state, allowing him to become involved in NAACP branches all over Mississippi. Darden gained the most attention in 1959 when he was charged with disturbing the peace at Harris Junior College, a black school in Meridian. The college suspended a group of students that included Darden’s sons as well as James Chaney, who was later murdered by the Ku Klux Klan during 1964’s Freedom Summer, after they wore badges commemorating the fifth anniversary of the Supreme Court’s Brown v. Board of Education decision. Darden spoke with the principal and photographed the students leaving the school following the suspensions. When he arrived home, local police confiscated the film. Darden was fined fifty dollars for disturbing the peace by encouraging the students’ protest. Darden began to disagree with the direction of the movement in Mississippi early in 1960. Students and other young African Americans began to favor the direct action taking place in other parts of the country, most notably through sit-ins. Darden argued that white business leaders had begun to arm themselves in preparation for such protests and discouraged direct action in favor of continued registration and voting. The NAACP’s Mississippi field secretary, Medgar Evers, and others preferred direct action. 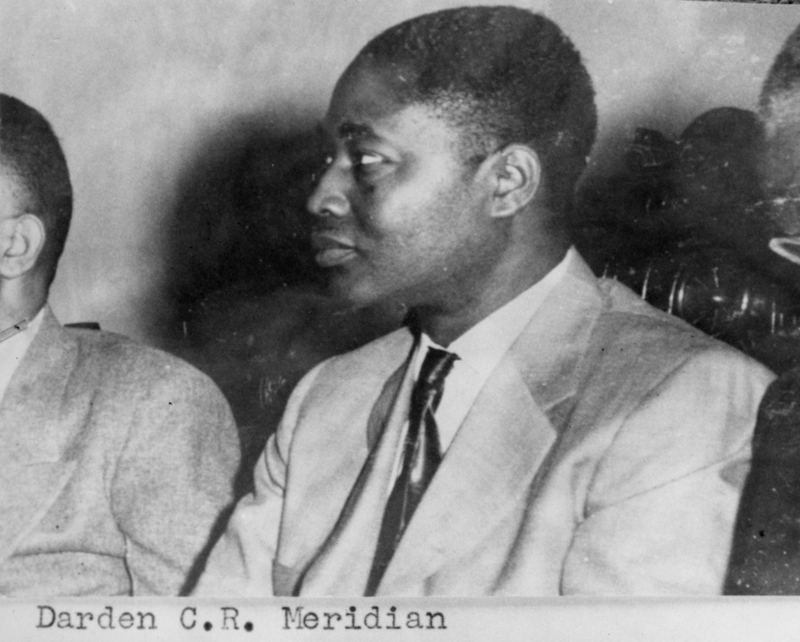 Darden and Evers developed a professional and personal feud over the organization’s direction, and in the fall of 1960 Clarksdale druggist Aaron Henry succeeded Darden as the Mississippi NAACP’s president, in large part as a result of the support of Evers and his influential Jackson branch of the organization. Darden continued his civil rights work and in 1964 was elected as an alternate Mississippi Freedom Democratic Party delegate to the Democratic National Convention. Until his death in 1994, he continued to live in Meridian with his wife, Inez. Written by Adam C. Evans, Washington, D.C.